Preheat the oven to 200°C. In a roasting tin, whisk together 4 tablespoons of honey, soy sauce and garlic. Toss the duck in the marinade, turn skin side up and sprinkle with the five-spice powder. Roast in the oven for about 15 minutes or until cooked all the way through. Baste the duck with the juices halfway through the cooking time. When the duck is cooked, shred the meat and toss with the remaining honey. Grill for 1-2 minutes, stirring occasionally until the duck is crispy. For the coleslaw, combine the vinegar, sugar, oil, cabbage, salt and berries and allow to stand for 20 minutes. 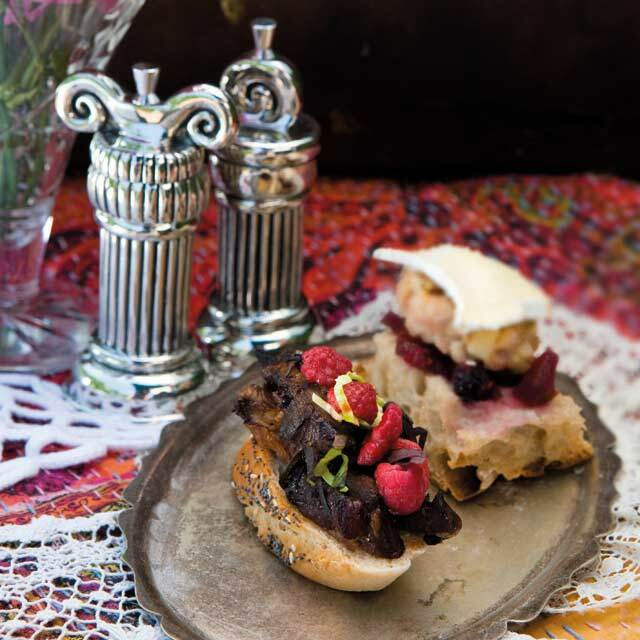 Fill the rolls or top the sliced baguette with the duck and top with the berry slaw. TOP TIP Replace the duck with pork. Simmer the sugar, juice and vinegar until dissolved. Add berries, apple and ginger and reduce until thickened. Season well. Mix the pork, apple, thyme, egg, breadcrumbs and seasoning and form into small meatballs. Grill or pan-fry until cooked. Serve the meatballs in the baguettes with chutney and topped with the Camembert. TOP TIP Replace the meatballs with grilled chicken breast pieces, if desired.